Contacts are managed on the Contacts tab. To add a contact, click on "Click here to add a new Contact." 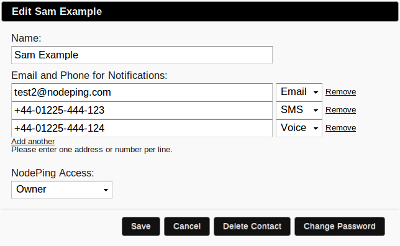 To edit an existing contact, click on their name.Enter the person's name in the Name field. Their name will be used on lists and for adding notifications. Then enter an email address, phone number, or twitter handle. You can set multiple contact methods (there is no limit) by clicking "Add another," or you can remove them by clicking "Remove." When you set up notifications, you will be able to select individual addresses, phone numbers, and twitter handles for each notification. Twitter handles should start with an '@' symbol and required that the twitter user is following @NodePing in order to receive direct messages. Contact Groups are used to group contacts, making them easier to assign for notifications. To add a group, go to the Contact Groups tab and click on "Click here to add a new Group." Give the group a name, and add people to it using the Add Members drop down. To remove someone from a group, click "Remove" next to the contact you want to remove. You can have any number of groups in your account, and groups can have any number of contacts in each group.